Nick Kyrgios: I'm good at fancy shots; Roger Federer: Hold my beer! Home News Nick Kyrgios: I’m good at fancy shots; Roger Federer: Hold my beer! Nick Kyrgios: I’m good at fancy shots; Roger Federer: Hold my beer! Roger Federer is known for his trick-shots and tricky performances on the court which undoubtedly makes him one of the best players to have played the game. He is currently ranked at no.2 in men’s singles by the Association of Tennis Professionals (ATP). The 37-year-old sensation managed to return a drop-shot from Kyrgios and flick it past the post and the whimsical Australian on his way to a three-set win against him at the US Open 2018. Roger was already in control leading by two sets to love when he produced the shot at advantage point for Kyrgios at 3-3. “You don’t get an opportunity to hit around the net post very often, I definitely think it was a special one, no doubt about it, the net is out further and the court is more narrow, so for a shot like this to happen in a practice, you will be running into a fence and you will hit it into the net. These shots can only really happen on a big court,” said Federer. As Kyrgios was already struggling to make an impact in the match, a sudden show of magic from Roger stole the show. He was amused to see him play such a trick shot and explained it to be unreal in an interview. 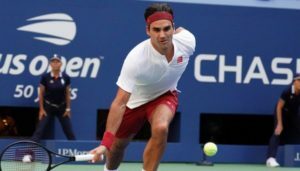 Roger Federer currently boasts 20 Grand Slam singles title- the most won by a man in the history of the game, a record eight Wimbledon titles, a joint-record six Australian Open titles, a record five consecutive US Open titles, and one French Open title. He is one of eight men to have achieved a career Grand Slam. It’s no wonder that Roger does moments of magic in a match! India’s Jinson Johnson runs, runs, runs to the 1500 m gold and history books!